The ancient Egyptians used a curious way to multiply two numbers. The algorithm draws on the binary system: multiplication by 2, or just adding a number two itself. Unlike, the Russian Peasant Multiplication that determines the involved powers of 2 automatically, the Egyptian algorithm has an extra step where those powers have to be found explicitly. The applet below allows for experimentation with the algorithm I'll present shortly. 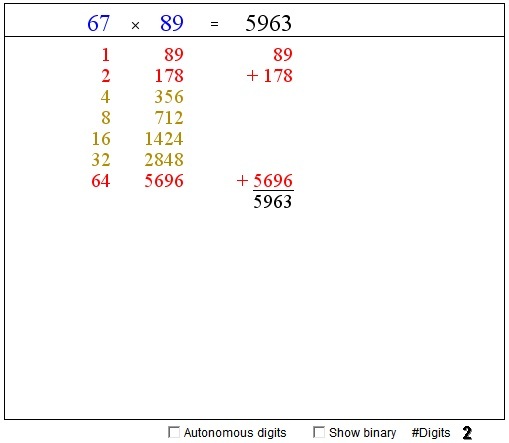 The two blue numbers at the top - the multiplicands - can be modified by clicking on their digits. (The digits can be treated individually or as part of a number depending on the state of the "Autonomous digits" checkbox.) The number of digits in the multiplicands changes from 1 through 4. According to the Rhind papyrus these powers are found the following way. 64 is included simply because it's the largest power below 85. Compute 85 - 64 = 21 and find the largest power of 2 below 21: 16. Compute 21 - 16 = 5 and find the largest power of 2 below 5: 4. Compute 5 - 4 = 1 and observe that the result, 1, is a power of 2: 1 = 20. This is a reason to stop. The powers of two that go into 85 are 64, 16, 4, 1. The proof that the algorithm works is exactly the same as that for Russian Peasant Multiplication.